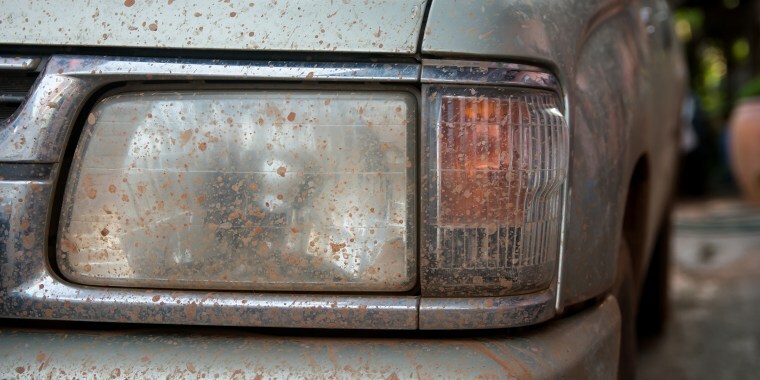 The last thing you need when you're driving in the rain, snow and fog of winter is dirty car headlights. Before you spend hundreds of dollars replacing them, you should consider restoring them. You’ll make driving at night easier and safer — and save a few bucks, too. According to Brian Noble, North America marketing manager for Sylvania Automotive, two factors contribute to foggy headlights: road debris and UV rays from the sun. Both wear away at the protective coating on headlights. To fix the situation, the damaged coating needs to be removed and a new protective coating added. Although experts say you should bring your car in for a professional headlight restoration service, here are some of the most common DIY methods we've seen for cleaning headlights. If the headlights are only slightly foggy, you can try and restore them using an abrasive, like toothpaste, and lots of scrubbing. First, clean the headlights with Windex or soap and water. Then, using a soft cloth, rub a fingertip amount of toothpaste onto the wet headlight. (Toothpaste with baking soda works best.) Start scrubbing. Keep the surface wet and apply more toothpaste as needed. Once you’ve removed the protective coating, apply a sealant. When choosing a restoration kit, look for one that contains several grades of sandpaper, a plastic cleaner/polish, polishing cloths and a protective coating. One kit usually has enough to clean two headlights. Follow the manufacturer’s directions. Don’t improvise. Don’t rush through it. Depending on how foggy headlights are, this could take 15-20 minutes per headlight. Remember, you’re rubbing away years of oxidation AND the original protective coating. As you sand, run your hands over the wet headlights. If you feel rough spots, sand until smooth. Be careful not to scratch the car’s paint while sanding. Some kits recommend taping around the headlights to help. But be careful: The tape itself may lift off the paint on some older cars. Keep it wet. Use a spray bottle, a bucket of water or a hose to wet surfaces while sanding. Trust the kit. The headlights will look hazy after sanding but they’ll be clear after applying the coating. Make sure the headlight is completely dry before applying the protective sealant. Allow the sealant to dry for several hours — better yet, overnight — before using the car. You don’t want bugs or dirt sticking to your newly restored headlight. Some kits require reapplication of protectant every 1-3 years, depending on weather, temperature extremes and if the car is kept inside a garage or not. Make sure to exercise caution when using DIY kits; if you're not too familiar with how to restore headlights, you could run the risk of ruining them completely if you use a kit, according to Alex Murenko, the owner of ONEighty, an automotive shop that offers headlight styling and restoration services in New York City. "If they don’t put the protective film on there, people can restore their headlights but six months later, they’re going to start yellowing again because the original coating from the manufacturer is already wearing off," he said. "Once you polish them, there’s no more coating, so now you’re back to exposing the headlights to natural elements like rain, snow, the sun, the dirt." Instead of tackling the job yourself, Murenko recommends drivers have their headlights restored by professionals. "We’ll lightly sand down all the yellow and dust with a very fine sandpaper," he said. "When you sand it, it just becomes a matte finish. That's why afterwards we have to buff it and polish it. This restores the clarity and the shine. After we buff and polish, we put clear protection film on them to protect them from yellowing, from rock chips, from scratches." The next time you notice your headlights starting to get dull, keep these tips in mind!